During these cold winter months it is important if you have an onsite septic system to know where and why your septic system froze. This blog is going to help determine if it is necessary to make any changes, repairs, or corrections in order to make sure the system is going to operate properly in the future. The most important thing is knowing what type of system you have and finding out where the freezing has occurred because that will determine how many steps will be needed to fix the problem. With plummeting Minnesota temperatures sometimes the problem can be a lack of snow to insulate the system, which is an easy improvement. Sometimes the solution might not be that easy and may result in significant changes or repairs to the system because of the installation of system or even the amount of water use. 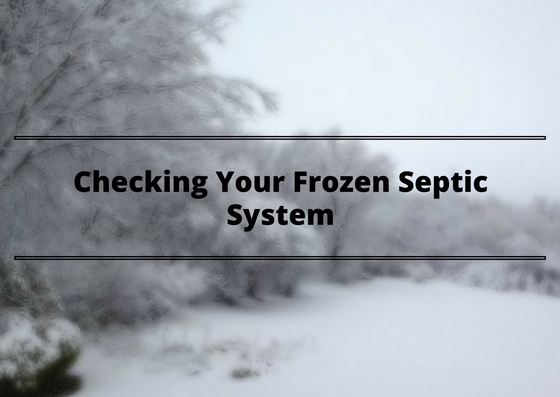 In order to prevent further freezing to your septic system, it is important to identify where and why your system froze the first time. If you are unable to identify why your system is freezing you can hire a licensed professional to assist you. If this pipe is frozen there are two issues that should be assessed. The first issue is making sure there are not leaking toilets or faucets or low wastewater generating devices that are discharging into your septic system. The second issue you should assess is making sure the pipe has the correct slope and does not have any sags to make sure it is draining properly. You should check the baffle, the device used to restrain the flow, and make sure it has not been damages. You should also check the pump if there is one in your system to make sure the floats are not damaged. The pump should be checked to assure it is running properly and able to switch on and off when necessary and should be visible at all times. Just like the pipe that connects the house and tank, the pipe that connects to the soil treatment area can have the same problems. In addition to that, you should also make sure the weep hole is draining water even when the pump is on. An evaluation of your septic system may be necessary if the soil was wet or moist before the winter. Sewage should not rise to the surface when frozen in the winter and is a health hazard that should be checked right away. These problems could potentially arise again. The solutions can potentially as simple as adding topsoil, but should be assessed by a professional. If you are unable to assess where and why your septic system is freezing you should consult a licensed professional that is trained in troubleshooting these problems.